Another fine day and another fine performance from the Five Arches team. We once again visited Pembroke Dock and enjoyed their fine hospitality. On Rink 1 Ashley and his rink of Eamonn, Ken and Mike had a slow start and found themselves 8-2 down after six ends. However a run of 17 shots in the next five ends secured the match and they ran out eventual winners by 23 shots to 18. Rink 2 saw Roy reunited with long time partners Dai, Tony and Gwyn, they also suffered from a slow start and were 12-2 down at tea. A fine comeback brought them within 3 shots by the 18th end, however the Pater rink responded and held on win by 22 shots to 17. 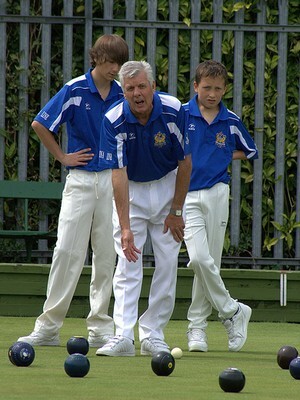 Ben once again stepped up to play skip and ably supported by Ken, John and Tenby import JR had another fine victory. A tight match at tea with the Five Arches quartet leading by 8 shots to 6, but in a remarkable second half, they won 10 of the 11 ends and eased to a fine 27-9 victory. Out on rink 5, Tony and his rink of Aaron, Ben and Clive had a comfortable and dominant victory. Never behind in the match, they pulled further and further away to win by 29 shots to 8. Another 12 points consolidates our second position in the league and with the next game home to runaway league leaders Pendine on Friday night every point is important. Another glorious afternoon greeted us at Milford for this 2nd Division game against St Katherines. After our comprehensive win in the Brains Cup, the team was in a confident mood to pull out another good result. With usual skip Lee missing, experienced campaigner Roy Powling took over the reins on rink 2. The rink which included Eamonn, John and Ben as well as Roy had a solid game, they were never behind and finished well to run out 20-15 winners. Rink 3 saw the Five Arches quartet of Ken, Ken, Clive and Mike in a closely fought battle. After a bright start , they were overhauled and were 4 shots down at tea. There was a slight recovery in the second half but they could never get on level terms and finished losing by five shots. Ashley's rink of Dai, Tony and Gwyn continued their winning ways of recent weeks , 8 shots up at tea. They pulled away afterwards with counts of 5 and 7 to run out winners by fifteen shots. On rink five, Tony with his dynamic young duo of Aaron and Ben at lead and second, superbly supported by Ray at third had another comfortable win, winning 12 of the 21 ends they achieved a fine 22-13 victory. Overall another good result for the Five Arches, twelve more points to consolidate our 2nd position in the league. With runaway leaders Pendine still to come to Tenby , there is still hope of an interesting finish to Division 2. Next game is away to the Pembroke Dock Mariners on Sunday 11th July. After last weeks tremendous victory against Caerleon, the Tenby team travelled to Neyland to further their goal of retaining the League title against a Neyland team battling against relegation. After already defeating Neyland away in a Carruthers Shield qualifying match by 55 shots earlier in the season, the Tenby team were in confident mood to pick up more valuable league points. The task was far from easy and the Neyland team were unlucky not to win the league encounter. The Tenby team had to, once again, play with one player short after a late withdrawal and at 5 ends the team pulled away to lead at 5 ends by 11 shots. Neyland fought back to trail by 8.25 at 10 ends and 8 shots at 15 ends. Neyland then took the lead at 18 ends, to lead by 2 shots. A late rally by Tenby saw them win at the close by 3.75 shots and take 10 points to Neyland’s 4 (points). Andrew Muskett’s rink started well, leading by 8 and 7 after the 5th and 10th ends respectively. Neyland, with Alan King in fine form, came back to reduce the deficit to only 3 shots by the 15th end and took the lead by the 18th (end) to lead by 2 shots. Tenby tried to rally, but went down by 22-23 at the close after dropping 2 shots on the last end with Andrew’s last bowl disappointingly well short of making shot. Jonathan Webb played against Gordon Robson, the Neyland Captain, and the rink were consistently in front by a couple of shots until the 15th end, when a dropped count of 3 (shots) followed by a run of 4 consecutive lost ends saw them 17-20 down by the 19th end. A score of two saw the rink go into the final end down by the solitary one shot. Then, with the team match also in the balance, Jon Webb played a superb bowl to make a count of 4 shots, to not only win the rink, but also win the match for Tenby. John Baggott once again was excellent and was backed up with the ever consistent Neil Dickinson. Paul Diment’s rink had a nice start, but by the 11th end, they were 7-12 down. By the 15th end they were 14-13 up and holding a count of 5 until a fortuitous shot by the Neyland skip saw them drop a shot and the game was level once more. 15-16 down going into the last 2 ends, Tenby with Gerald Hewitt and Cameron White in great form throughout the match took a 1 (shot) on the 20th end and then, when 6 down, Peter Day played the shot of the day by driving the ‘jack’ into the ditch to make 2 shots and win the rink 18-16. Due to the late withdrawal of one of our players as already mentioned, the team had to play a ‘triple’ and due to this a penalty of 25% was imposed on the game. Therefore, after 5 ends, the triple of Luke Rees, Steve Williams and Craig Guymer held a lead of 1 shot. At 10 ends, the lead was 0.25 and at 15 ends it was 1.5 shots. The triple still held that slender advantage until the last end, when Craig Guymer was very unfortunate not to make shot with his last bowl and the resulting dropped 2 shots saw a loss of only 0.25 shots (12.75 against 13). In conclusion, it could have been the maximum 14 points but it could have so easily been a defeat of the same score and therefore the Captain is quite happy to take 10 points off a Neyland team who played very well. I must say that the green played well and it was a pleasure to play on and credit must go to the Neyland greenkeeper and his staff. Next week, the Tenby sponsored, Layton and Co solicitors and Chandler Rogers Estate Agents, travel to Morriston which will be a very difficult match and the team know that a huge improvement will have to be made if success is to be achieved in Swansea. The team however will welcome back Mike Jackson, Pat Currie and Philip Carpenter. Following the semi-finals played at Milford throughout the last week, Tenby have representation in all the five main competitions. The singles matches were not played due to the bad weather on Thursday but with John Roberts playing Peter Day in the second semi-final, we will have a representative in the blue ribbon event. Phil Carpenter plays Richard O’Leary of Haverfordwest in the other semi final. Pat Currie and Jonathan Webb had an excellent win over former pair’s winners Nigel Davies and Steven Reese of Whitland and they will play Graham Hughes and Merv Dennis of Saundersfoot who defeated the junior international partnership of Luke and Craig Guymer by one shot. As mentioned last week, Gerald Hewitt, Arron Lloyd and Joe Richards had already made it through to the final and they will play Peter Day, Andrew Muskett and Paul Diment. The defending rinks champions of Mike Jackson, John Baggott, John Roberts and Phil Carpenter will play against Alan Whitehouse, Nigel Davies, Colin Wynn and Steve Reese of Whitland in which will be a very hard match and a repeat of the 2008 final. Finally, Craig Guymer will play against the defending champion, Ryan Thomas from Haverfordwest in the under 25’s final – a repeat of last years final. The Tenby Club started their defence of the Welsh Club Championship last Saturday with a trip to Caerleon. The Layton and Company Solicitors and Chandler Rogers Estate Agents sponsored team cam through the match in emphatic style winning by a huge margin of 97 shots. In what could have been the worst draw possible in playing a Monmouthshire Team away, in the first round, the victory was never in doubt. By the 5th end, the Tenby team had a lead of 25 shots and 5 ends later held a lead of 46 shots. The game as a contest was well over by the 15th end, in which Tenby had a lead of 57. The 18th end the team was 83 shots ahead and finished with a 97 shot winning margin. Philip Carpenter returned for the Carruthers having been ‘rested’ for league matches and held a narrow lead at 5 ends of a single shot. The lead had increased to 8 shots by the 10th end (14-6) and this increased to 9 shots by the 15th end thanks to a five shot count on the 11th end. A finish of a 3 and 4 shots on the 20th and 21st end saw the rink record a 18 shot winning margin. Pat Currie’s rink, with Luke Guymer in great form, raced off to a 7-1 lead at 5 ends and 15-3 at 10 ends. The 12 shot lead was maintained at 15 ends and a run between the 17th and 19th ends in which they scored 4, 7 and 3 shots saw a final winning margin of 33-8. Paul Diment’s rink started slowly but the second half of the game saw multiple counts consisting of three 4 shot counts, a five and a six to record a 38-11 shot win. Gerald Hewitt was sensational and was a major factor in the rinks huge win. Andrew Muskett, with Ben Simmons, making his Tenby debut was always in control. 14-2 up at 5 ends, the onslaught continued to record a winning margin of 27 shots (35-8). What a way to start the defence of the title. With all other clubs over Wales showing interest in how Tenby would perform after last years heroic’s, there can be no doubt that Tenby once again mean business. Next up is Morriston United from Swansea. This will be a much sterner test for Tenby as their green is the exact opposite to Tenby’s slick surface and a major contributor in their success over the years. The Tenby team lost to them in the quarter finals 10 years ago but defeated them easily a few years back, although that game was held at Tenby. In spite of their green, the Tenby team are much more experienced than their Swansea opponents and over the past few years have proved that they are by no means a home team side and perform equally well on foreign greens. The other Pembrokeshire representatives, Whitland, were surprisingly defeated at home by the Mid Glamorgan outfit, Ferndale, who although having lost a number of players to Aberdare Harlequins and Treodyrhiw, still managed a 7 shot win against the current Pembrokeshire league leaders. Tomorrow, Tenby travel to Neyland in a Pembrokeshire League Division One match. At the time of this report, the Tenby Club were also well represented in the County Competitions and had the opportunity to have all Tenby finalists in the Open Singles; Pairs; Triples and also representation in the Under 25’s, Under 18’s, Singles and Rinks. Luke Guymer and Craig Guymer were in the pairs against Saundersfoot with former Welsh Pairs Champion Pat Currie and Jonathan Webb in the other semi, against Whitland. Gerald Hewitt, Arron Lloyd and Joe Richards have already made it through to the Triples semi final and they will play either Peter Day (Former Welsh Triples Finalist), Andrew Muskett (former Welsh Triples winner) and Paul Diment or a Whitland Triple. The rinks have Mike Jackson, John Baggott, John Roberts and Phil Carpenter playing against Fishguard and in the singles, Peter Day takes on John Roberts, with the winner playing either Phil Carpenter (defending champion) or Nigel Davies of Whitland. In the under 18’s, Luke Rees is cementing what has already been a great season for him and the under 25’s have Junior Internationals Craig and Luke Guymer. Full final representation will be provided in next week’s report. 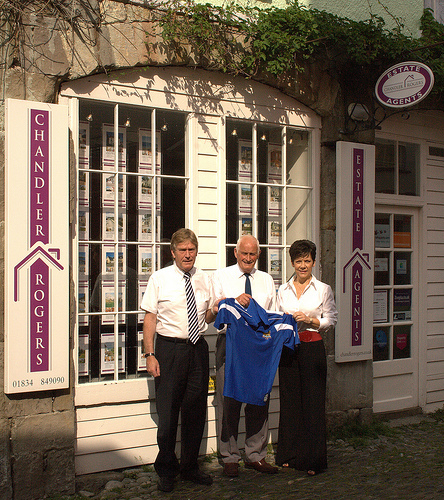 Tenby Bowling Club are delighted to have Chandler Rogers Estate Agents on board as mens' shirt sponsors this season. Here Martin Rogers (l) and Karen Chandler (r) are joined by Tenby BC Chairman John Baggott.